This is the photograph of male Lesser Birds of Paradise (Paradisaea minor). 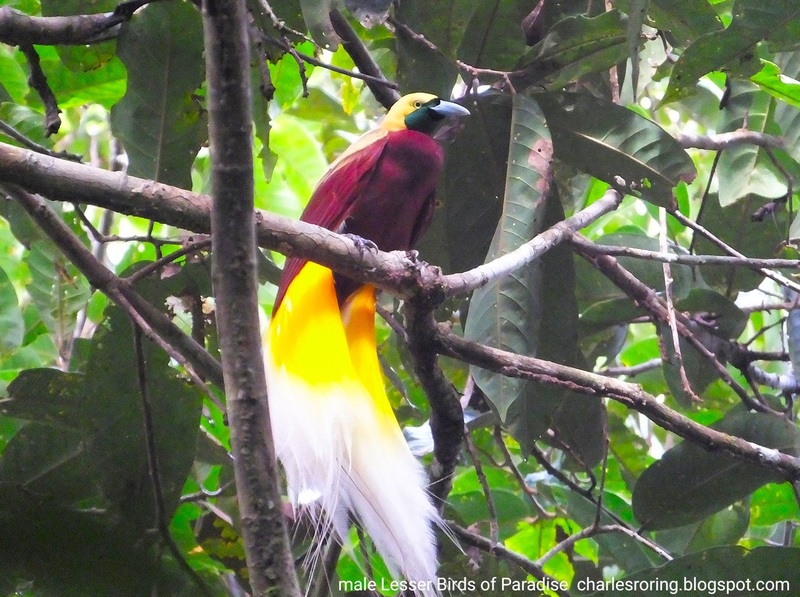 I often see the birds when I guide visitors in lowland forest of Sorong regency. It is a city which has been the main gate to Raja Ampat. As a matter of fact, Sorong has got huge area of tropical rainforest that is home to a lot of species of birds, mammals, reptiles, and insects. There are a lot of plants that grow in the forest such as iron-wood tree, matoa tree, and huge pandanus tree. Visitors spend between 3 to 4 days hiking and watching wild animals in the forest. From my previous wildlife tours in this environment I saw deer, northern cassowary, wallaby, ulysses butterfly and beautiful wild flowers. Arrive in the village, take a rest, birdwatching around the clearing area of the village. Wake-up early in the morning at 04.00. Have tea or coffee and make preparation At 04.30 leave the village for the birdwatching site of Lesser BOP. Arrive at 06.00. Watch birds until 09.00. Walk back to the village. Have lunch. Take a rest. Jungle walk again to watch birds and other wildlife. After dinner, we could do night walk to see wallaby thats comes out at night to find food and mating partner. 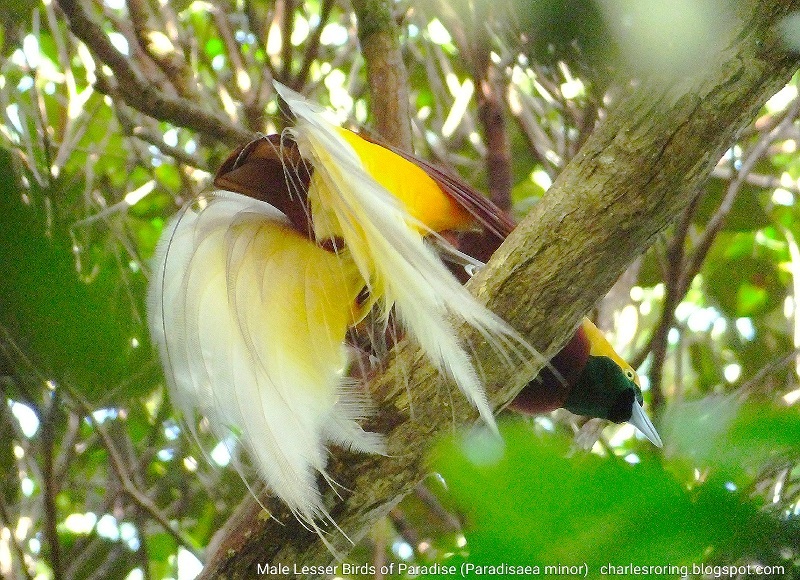 Wake up in the morning to birding site of Twelve-wired Bird of Paradise. After that, we will continue to the birding ground of King Bird of Paradise. Morning walk to the river in the west of the village. Visitors can enjoy swimming or exploring the surrounding forest. Back to the village. After lunch, we could walk slowly back to the main road again and then back to Sorong city by car. Please, contact me (Charles Roring) by email to: peace4wp@gmail.com or whatsapp: +6281332245180. I need information such as name, country of origin, date and time of arrival and how long you plan to do the rainforest tour. Idea durvillei is a large black and white butterfly that I see in Mansinam island of Manokwari; Waim islet and Waigeo island of Raja Ampat. They live in coastal forest. I have never seen it in higher montane forest such as Arfak mountains and Tambrauw Mountains. The wings are white decorated with black lines. The abdomen of this beautiful insect is white. From my personal observations, the butterfly likes to find nectar of flowers early in the mornings. In the afternoons when the temperature is high, the butterfly prefers to take a rest on a green leave of shrubs under the shades of big trees. 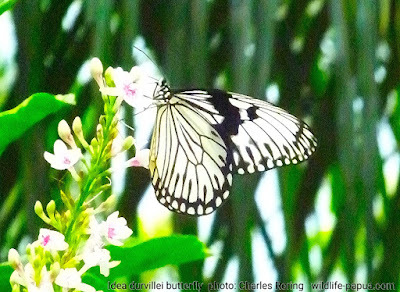 Actually, there are a lot of species of butterflies that we can see when we go hiking in lowland forest including cruiser butterfly - Vindula arsinoe, Silky Owl Butterfly - Taenaris catops, and the Blue Mountain Swallowtail - Papilio ulysses. The best months to watch butterflies in West Papua are during dry season June to early December. 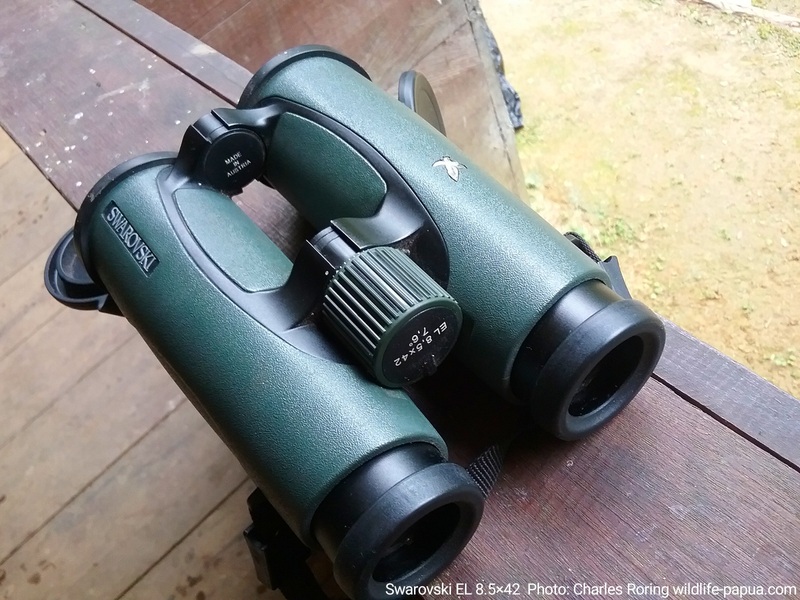 In my previous post Wildlife Binoculars, I mention about Swarovski SLC 10×42 WB which is a very sturdy optical device for field use. Actually, there are a lot of other brands that can also deliver clear and crisp images of birds and other wild animals that we would like to watch especially in a distant tree, beach or in the sky. I personally have got some Chinese made 10x 42 mm roof binoculars. They are not the best in the market but they give good quality images. I often bring them into the forest when I guide birdwatchers. Several years ago I thought that binoculars with higher magnification were better. In reality I was wrong. I used to buy a pair of binoculars from a shop in my town without checking its performance in the field - a Chinese made Papillon 12-36×70 binoculars. 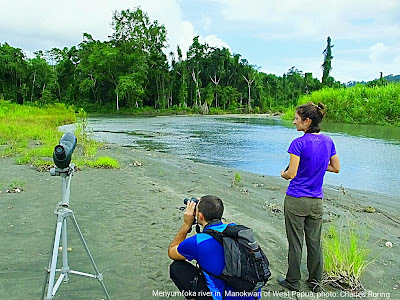 The next day, I brought the binoculars to the field when I guided a French couple on a 3 day/ 2 night riverwalk and birdwatching tour in lowland forest of Manokwari. When I tried the device, I was very disappointed with the image quality it produced. My old binoculars with lower magnification gave me sharper and clearer views of birds, scenery and trees. From that day I decided to read more information on the internet about binoculars. 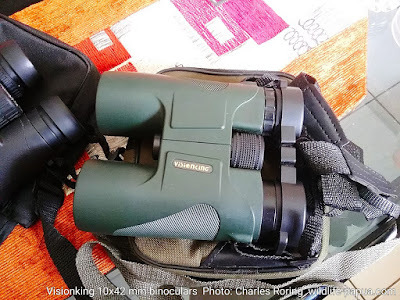 I spent more time reading about technical aspects of binoculars, here are some of the features from the binoculars which birdwatchers must know. Brand name and long tradition in binoculars manufacturing - Companies that have manufactured binoculars for tens of years have got more experience and expertise in making high quality binoculars. Zeiss, Swarovski, Leica, and Nikon are some of the manufacturers that have created high precision optical products including binoculars. High quality binoculars are made of high definition glass lenses such as Extra-low Dispersion glass and Bak4 prism. In tropical rainforest, the frequency of rainfall and humidity is high. Binoculars have to be sealed with waterproof O-ring and filled with dry nitrogen. To ensure the production of clear and sharp bird images, every surface of the lens in binoculars have to be painted with anti reflective compounds. Binoculars are essential for wildlife watching when we go hiking in the forest. I personally use a good pair of Visionking 10x42 mm binoculars. It is equipped with Bak4 roof prism, Field of View: 303 feet@ 1000 yards with central focusing. They are light and small enough to carry. They are not the best but they can give me sharp images of birds and wild animals that are flying or perching on the branches of high trees. Because I work as birdwatching guide, I had the opportunities of trying other binoculars that are carried by birdwatchers. I used to try Nikon EDG 8×42 binoculars. These birding optics are made of Extra Low Dispersion glass lenses. Although the magnification is smaller than my Visionking. The quality of the images is crisp and superior. I can say that the Nikon EDG 8×42 binoculars are one of the best wildlife binoculars that I have ever tried. Recently, I also tried a pair of Swarovski SLC 10×42 WB. The binoculars belonged to Mr. and Mrs. Buttiker. They were birdwatchers who came from Switzerland. I guided them to Arfak mountains to watch Vogelkop Bowerbird, Western Parotia, Green-backed Robin, female Black Siklebill, Feline Owlet-nightjar, and Bronze Ground Dove. Their Swarovski binoculars greatly enhanced their birding experience. It was rainy season in Arfak mountains when I and the Swiss couple went birding in along the unpaved road in the forest. I was impressed with the performance of the Swarovski SLC 10×42 WB binoculars. They were very sturdy and well fit in my grip. I offer bird and wildlife tour for visitors who are interested in adventure trip to Arfak mountains, Klasow valley, Tambrauw Mountains and Raja Ampat Regency. Please, contact me (Charles Roring) by email to: peace4wp@gmail.com or whatsapp: +6281332245180. 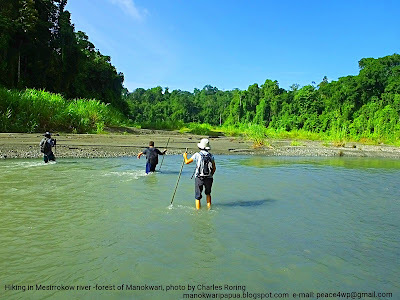 There is a forest area in Manokwari that is suitable for wildlife watching. Its name is Susnguakti forest in the south of the city. Animals such as cuscus possum, blue-tailed lizard, butterflies, fireflies, and several species of birds of paradise live there. I personally have organized tens of wildlife tours to this forest. There is a basecamp that local villagers built for visitors. It is covered by corrugated metal roofs and plastic tents. 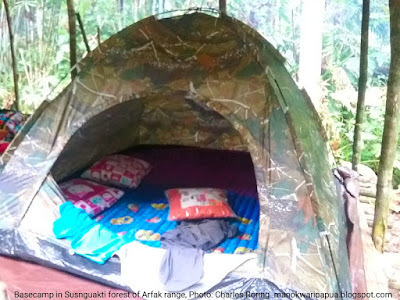 Mattrasses, pillows, cooking and eating utensils are available in the forest. We will meet you at the Rendani airport of Manokwari city, or at the hotel where you stay. After buying food supplies, we will go by car to Susnguakti forest. It takes 1 hour to reach it. Arriving in the forest, we will start hiking for one and a half hour to reach our basecamp. Water will be boiled and food is cooked when we start to install our dome tents, and sleeping materials. 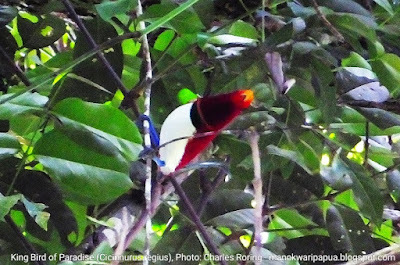 After having some tea or coffee with biscuits, we could go to the nearby forest area to watch Lesser Birds of Paradise (Paradisaea minor). We will enjoy dinner at around 19.00. We could install white screen cloth and shoot it with light so that we could see the kinds of nocturnal insects that land on it. Early in the morning, we will wake up early to have tea or coffee. After that we could enjoy morning walk again to watch Lesser Birds of Paradise hoping that we will have better sighting of the paradise birds. At 09.00, we could move to higher ground to watch King Bird of Paradise (Cicinnurus regius). After lunch, we could take a rest for a while or do jungle walk to see butterflies, lizards, or other insects. At night, we will do jungle exploration to see cuscus possum (a nocturnal marsupial animal that comes out at night to find fruits and mating partner), sometimes spiky dragon lizard could be seen in the forest. A short visit to bamboo forest will allow us to see glowing mushrooms (especially during rainy season). We will do morning walk to watch Magnificent Riflebird, Hooded Butcherbird and Coconut Lorikeet that like to eat fruits and nectar from flowers around our basecamp. After lunch, we can start descending the slopes of Susnguakti forest to main road again. A stop in the village is highly recommended where we will meet villagers. We will return to Manokwari city again after saying Good Bye to our local guides and villagers. 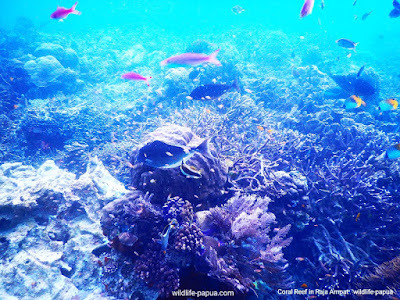 For visitors who are interested in coral reef, we could extend our tour by snorkeling in some coral reef sites of Manokwari to see damselfish, butterflyfish, moorish idol, or anemonefish. Please, contact me: Charles Roring by email to: peace4wp@gmail.com or by whatsapp: +6281332245180. These are photographs of Rainbow Bee-eater that I saw in Klasow valley of Sorong regency. They were taken in May. According to field guide book, "Birds of New Guinea," the birds migrate to New Guinea during March to October. Rainbow Bee-eater perched on the branches of trees in the cleared forest in the morning waiting for insects. The sun was shining brightly. I walked closer to them and began to take pictures of them. They were not afraid of me when I shot them with my old Fujifilm HS50EXR. 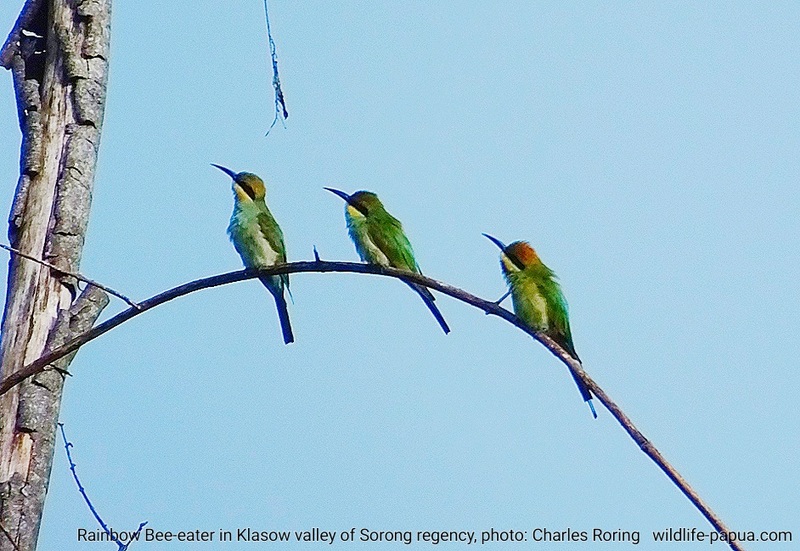 I also saw a large flock of Rainbow Bee-eater in lowland forest of Manokwari in June when I guided a French tourist. Perhaps, they had just arrived from a long flight crossing over the huge tropical rainforest of New Guinea. During the sunset time, they were flying very low over our heads when we sat on the sandbank of Mesirrokow river in a relaxed atmosphere. We really enjoyed the sighting very much. Unfortunately, it was getting dark, so, I could not take pictures of them. The lowland forest of Manokwari is the natural habitat of a lot of species of birds such as Large-tailed Nightjar, Golden Myna, Little-ringed Plover, Sulphur Crested Cockatoo, Eclectus Parrot, Black-capped Lory, Coconut Lorikeet, Palm Cockatoo, Yellow-capped Pygmy Parrot, Brahminy Kite, Variable Goshawk, Little Egret, Dollarbird, Rufous-bellied Kookaburra, Glossy-mantled Manucode, Magnificent Riflebird, and a lot more. I offer hiking and birdwatching trips for visitors who are interested in watching paradise birds and other tropical birds of New Guinea, particularly in such places as Arfak mountains, Lowland Forest of Manokwari, Klasow valley in Sorong regency and tropical islands of Raja Ampat. In general, a short birdwatching trip in Lowland Forest of Manokwari may last for 3 days/ 2 nights whereas a full bird tour to Arfak range, Klasow valley of Sorong and Waigeo island of Raja Ampat may last for 2 weeks. Please, contact me (Charles Roring) by e-mail to: peace4wp@gmail.com or by whatsapp to: +6281332245180. The lowland forest of New Guinea is a very rich environment. It is the one that exists in northwest region of Manokwari. To explore the forest, the best way is by walking along the sides of a river that passes through the forest. Recently I guided 3 French visitors on a 3-day/ 2-night riverwalk and birdwatching tour to the lowland forest of Manokwari. The name of the forest was Mesirrokow. It was the natural habitat of a lot of species of birds including Sulphur Crested Cockatoo, Eclectus Parrot, Palm Cockatoo, Blyth's Hornbill, Yellow-faced Myna, Little-ringed Plover, Dollarbird, Brahminy Kite, and etc. Other animals such as wallaby, wild pigs, deer, cuscus possum, and soa-soa lizard, as well as beetles and butterflies also live in the forest. The variety of the vegetation is very high including iron wood tree, pandanus tree, creeping plants, shrubs and grass. We built tents on higher ground near the river and then did the riverwalk tour every mornings and afternoons-before sunset time. When the weather is good, we can walk along the banks of the river easily. One of the guests brought his Swarovski Spotting Scope and Leica binoculars. They greatly enhanced our birding experience. I personally carried my Visionking 10x42 mm binoculars. With these birding optics, we could watch Glossy-mantled Manucode (Manucode ater), Lowland Peltop (Peltops blainvillii), Pink-spotted Fruit Dove (Ptilinopus perlatus), Little Egret (Egretta garzetta), Variable Goshawk (Accipiter hiogaster). We bring big size 8x6 meters waterproof plastic sheet as our roof tent, several dome tents, mattrasses, and pillows. We also bring cooking and eating utensils to serve our customers. Food such as noodles, canned fish, coffee, tea, and fruits are bought from the supermarket but we get most of our vegetables from the surrounding forest. Our guests said they really enjoyed the camping trip in open nature. In addition to camping, riverwalk and bird/ wildlife watching, they could enjoy swimming as much as they liked. Visitors need to bring a good pair of binoculars, a waterproof spotting scope is also needed. For riverwalk, please wear a good pair of watershoes, t-shirt and short pants. Some visitors apply sunblock lotion. I recommend anti-insect lotion. After that they could take a domestic flight to Manokwari city. Airlines such as Garuda, Sriwijaya, Batik and Lion/ Wings Air have got regular flights to Manokwari. I have organized birdwatching tours for visitors who want to go to Arfak mountains for years. 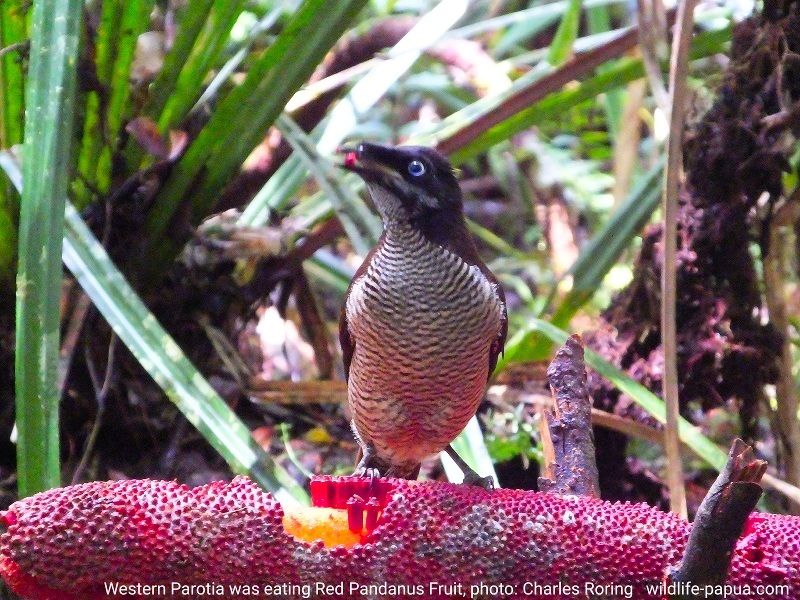 There are 2 different birding locations in West Papua, i.e. Lower Montane Forest and Upper Montane Forest. There are several guesthouses built by government and now operated by local people. For this type of environment, the recommended destination is Susnguakti forest located in the eastern region of Arfak mountains. Birds that can be watched including Lesser Birds of Paradise (Paradisaea minor), King Bird of Paradise (Cicinnurus regius), Magnificent Riflebird (Ptiloris magnificus), Hooded Butcherbird (Cracticus cassicus), Common Paradise Kingfisher (Tanysiptera galatea), Coconut Lorikeet (Trichoglossus haematodus). There are several jungle huts that were built as shelters for tourists who want to stay for a few days watching birds and other wild animals. I provide mattrasses, pillows and tents, as well as cooking and eating utensils in the jungle huts. Birds are not the only animals which visitors can watch in the lower montane forest of Arfak mountains. Visitors can watch cuscus possum, bandicoot, Arfak dragon lizard, colorful butterflies, and fireflies. I and some local guides can organize nightwalk for visitors who are interested in watching nocturnal animals. To do birdwatching in Arfak mountains, visitors need to wear good trekking boots, short and long pants for hiking tours along the road and trails in the forest. Birds usually perch on the branches of high trees. A good pair of binoculars and a spotting scope will be helpful for watching birds and other wild animals. Don't forget to bring anti-insect lotion to protect you from mosquito and other insect bites. Head torch or flash light is also needed for night walk. After that take a domestic flight to Manokwari city. Regular flights between Jakarta or Manado city and Manokwari are served by Sriwijaya, Garuda, and other airlines. I will meet you at Rendani airport or at a hotel where you stay in Manokwari city and organize your tour to Arfak mountains. Sorong is a city in West Papua province of Indonesia that has become the main gate to Raja Ampat. There is a huge valley in the east of Sorong that is famous among birdwatchers as the most recommended site for watching Paradise Birds. Its name is Klasow Valley. Lesser Birds of Paradise (Paradisaea minor), King Bird of Paradise (Cicinnurus regius), Magnificent Riflebird (Ptiloris magnificus) and Twelve-wired Bird of Paradise (Seleucidis melanoleucus) live in tropical rainforest of the valley and can be watched together with hundreds of species other of birds. Visitors who go to Klasow valley usually spend at least 4 days/ 3 nights in the jungle to watch birds, and other wild animals, as well as wild flowers and unique tropical plants of the rainforest. There is a small village in the middle of the forest. There are also two jungle huts that have been prepared for visitors. The huts are equipped with mattrasses, mosquito nets and toilets. 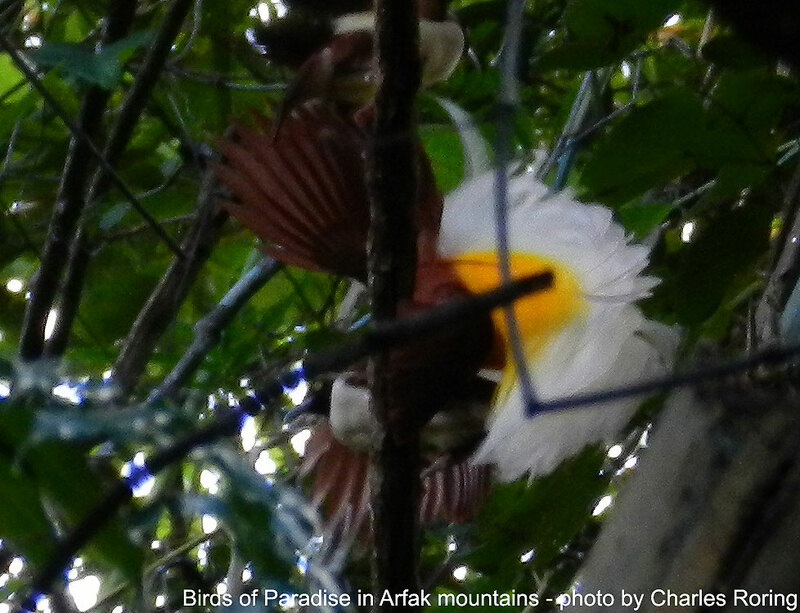 The birdwatching site for Lesser Birds of Paradise is approximately a 1.5-hour-walk from the village. Visitors who want to watch the paradise birds need to wake up early in the morning at 04.00 to have tea or coffee and to make preparation until 04.30. After that they have to start walking. Because it is still dark, head torch will be needed for the morning jungle walk. There is another birdwatching site for Lesser Birds of Paradise approximately 30 minutes walk from the village. But the tree where the birds dance is quite high. Each visitor who wants to watch birds at this site needs to bring a good pair of binoculars. Usually, the activity of Lesser BOP at their display trees decreases after 09.00. Birdwatchers can walk back to the village to take a rest and have lunch. 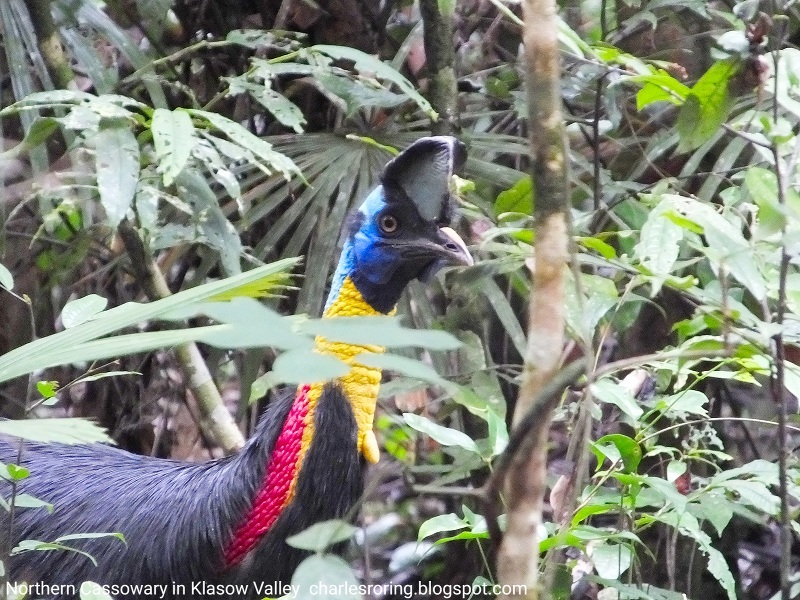 There is also Northern Cassowary that regularly visits the village to ask banana fruits and sugar cane from villagers. It is a very big bird and dangerous. I used to guide a group of visitors from Rockjumper. We spent 2 days/ 1 night in the valley to watch birds. We were quite lucky to be welcomed by this Northern Cassowary. But we have to keep safe distance from the bird. During our tour in Klasow valley, we were able to watch King Bird of Paradise, Northern Cassowary, Yellow-faced Myna, Helmetted Friarbird, Black Lory, Boyer's Cuckooshrike, Red-cheeked Parrot, Glossy Swiftlet, Pinon Imperial Pigeon. Birds are not the only animals that live in this lowland forest of Sorong, there are butterfly and beetles, cuscus possum, wallaby, fish and frogs in the river, snake, wild pigs, soa-soa lizard, dear and even crocodile in big river. Want to visit Klasow valley? Fly from your country to Jakarta (capital of Indonesia) or Manado city (by Silk Air from Singapore). There are regular flights from these cities to Sorong city. I could meet you at the airport or at the hotel where you stay and organize your trip to Klasow valley. If you are interested in taking a birdwatching tour in West Papua and needs me to organize your tour, please, contact me by email to: peace4wp@gmail.com or by text message to my whatsapp: +6281332245180. 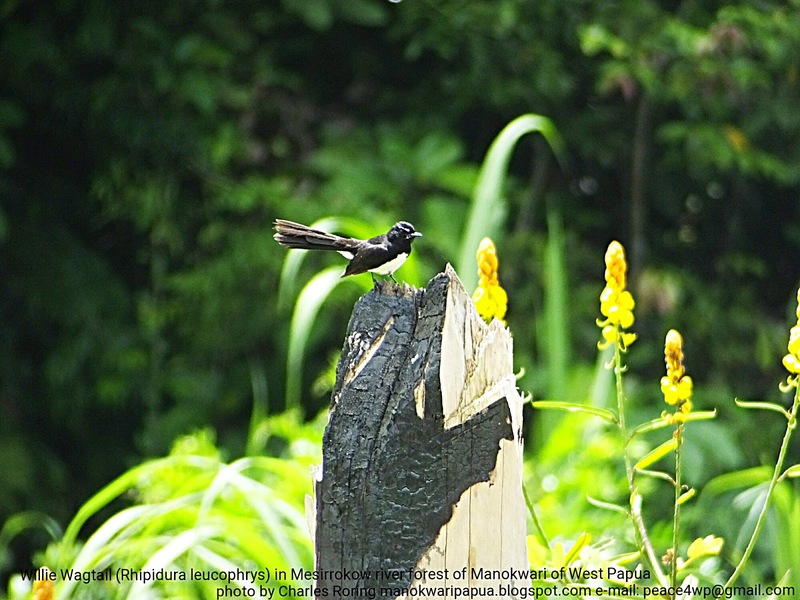 When I was hiking with two French tourists along the sides of a river in lowland forest of Manokwari, I saw a black bird that was playing on a burnt tree. Slowly I approached the bird to take some pictures. The bird was not afraid of me and kept on dancing, perhaps to attract his female partner. After examining my pictures, I could identify the bird. It was called Willie Wagtail (Rhipidura leucophrys). Because it likes to sit on dead trees near the river, I thought that the bird feeds on small fish. Later, from Wikipedia, I got the information that Willie Wagtail eats insects. I also saw flowers such as New Guinea Tulip (Spathodea campanulata) whose flower is orange, morning glory, Purple Tepals Water Hycinth (Monochoria vaginalis), New Guinea Scarlet Jade (Mucuna benetti) and Splendid Glory Vine (Varadaya splendida). The scenery of the river is also very beautiful. 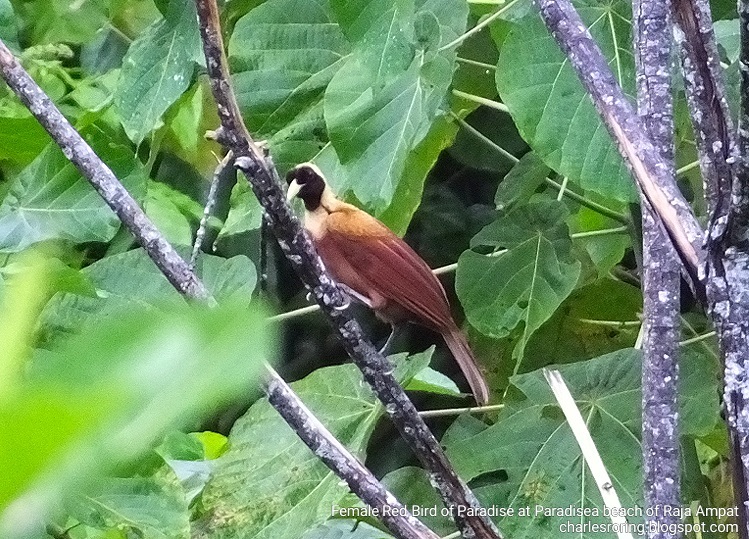 I also saw the bird in cleared forest near Waisai town of Raja Ampat. From the sighting sites, I could conclude that Willie Wagtail lives in coastal and interior region of New Guinea island especially in open habitat. The bird has got black upperpart feather with white underparts. It also has got beautiful sounds too. 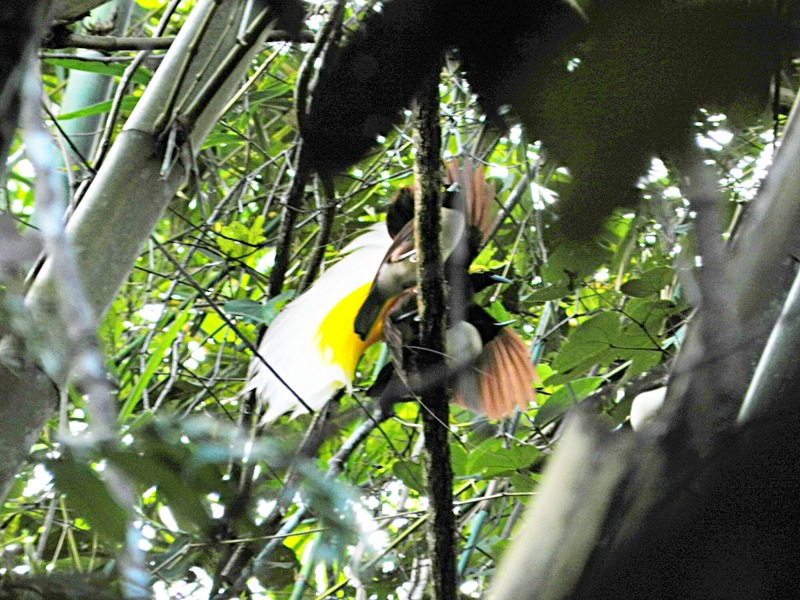 Actually, Willie Wagtail is not the only birds that we can see while hiking in the tropical rainforest of New Guinea. There are hundreds of birds that we can watch, some of them include Lowland Peltop, Pinon Imperial Pigeon, Brahminy Kite, Sulphur Crested Cockatoo, Palm Cockatoo, Eclectus Parrot, Large-tailed Nightjar, Pink-spotted Fruit Dove, Little Egret, and several species of birds of Paradise. I can organise rainforest wildlife/ birdwatching in Manokwari, Sorong and Raja Ampat. Short tour lasts between 3 to 5 days whereas long tour usually takes 2 weeks. The 2-week wildlife watching tour starts in Manokwari and then continues to Sorong and Raja Ampat and then finishes in Sorong city again. During the tour, visitors will be able to watch birds, cuscus possum, see wild flowers and butterflies in the jungle, as well as coral reef and colorful tropical fish. Visitors need to bring good binoculars, and snorkeling mask, and fins. There are regular daily flights between Manokwar city, Sorong city and Jakarta (the capital of Indonesia). You can take Garuda, Sriwijaya or Batik to reach West Papua. I could meet you at the airport of Sorong city or Manokwari city and organize your trip into the rainforest. If you are interested in taking a rainforest tour in West Papua and wants me to organise your trip, please, contact me (Charles Roring) by e-mail to: peace4wp@gmail.com or by whatsapp: +6281332245180. I often guide tourists in the forest. To watch birds, butterflies on distant flowers, or orchids in high trees, we usually use binoculars. I personally use a pair of 10x42 mm Visionking binoculars. They have got Bak4 roof prisms to deliver crisp images of birds or other wild animals that I watch. But they are not the best birdwatching optics available in the market. 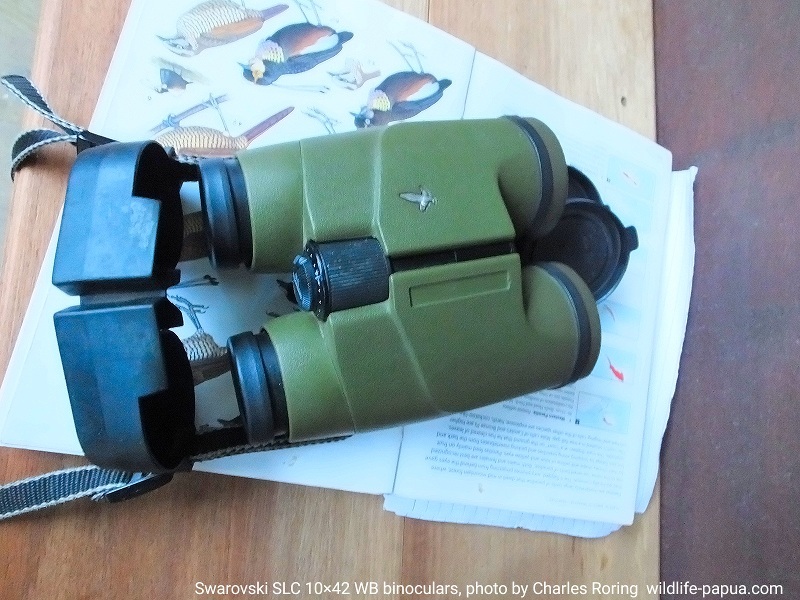 For the best wildlife watching experience, I highly recommend that visitors buy a pair of Swarovski SLC 10x42 WB binoculars. The binoculars have got fluorite HD glass elements, and are filled with nitrogen. They are light enough to travel with. These binoculars belong to Mr. and Mrs. Buttiker, Swiss tourists who visited Arfak range for birdwatching. During their trip in Arfak mountains, they were able to watch Vogelkop Bowerbird, Western Parotia, Green-backed Robin, Feline Owlet-Nightjar, Emerald Ground Dove, and etc. These birds were seen at the elevation between 1,300 and 1,500 meters above sea level. For birds that live in lowland and lower montane forest, the variety of species will be different. Based on my previous birdwatching experience, I saw Lesser Birds of Paradise, Glossy Manucode, King Bird of Paradise, Magnificemt Riflebird, Common Paradise Kingfisher, Hooded Butcherbird, Palm Cockatoo, and a lot more. Because the humidity and rainfall in tropical rainforest is very high, I highly recommend that visitors bring binoculars that are watertight or waterproof. There are also similar binoculars manufactured by Leica, Nikon or Vortex. In addition to binoculars, I also use a very affordable Kinglux 20- 60×60 spotting scope. It is equipped with Bak4 prism and is filled with nitrogen gas. Experienced birdwatchers usually bring Swarovski ATX 30-70×95 spotting scope. There are several birdwatching sites in Manokwari regency. One of them is Susnguakti forest in the eastern region of Arfak mountains. Its lower montane forest environment is the natural habitat of several species of paradise birds including Lesser Birds of Paradise (Paradisaea minor), King Bird of Paradise (Cicinnurus regius), Magnificent Riflebird. There are also other birds that can be watched in the rainforest of Susnguakti such as Hooded Butcherbird, Blyth's hornbill, and Common Paradise Kingfisher. Tropical rainforest that covers this area is actually a rich environment. Visitors can see colorful butterflies such as Vindula arsinoe, and various kinds of lizards, including the Arfak Dragon Lizard. There are snakes too. 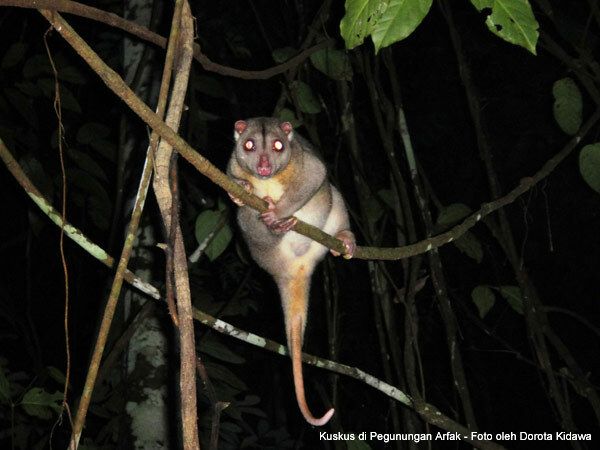 But the main attractions in Susnguakti forest, in addition to birds, are cuscus possum, glowing mushrooms, fireflies, and a large varieties of plants. 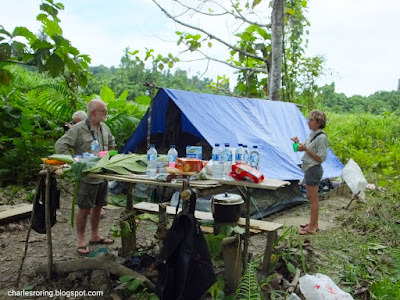 As of today, there is no guesthouse in the middle of Susnguakti forest of Manokwari. But we have built simple shelters for our guests who want to stay for a few days. We have served tens of visitors who come from various countries in Europe, North America, Australia and Asia. We also provide complete camping (shelter, mattrasses, and tents), cooking and eating utensils for visitors and local guides. Fly from your country to Jakarta, or Manado. These are big cities in Indonesia. After that, take a domestic flight to Manokwari. Airlines such as Garuda, Batik, and Sriwijaya have got regular flights between Jakarta and Manokwari. I can meet you at the airport or at the hotel where you stay and organize your trip to Susnguakti forest.